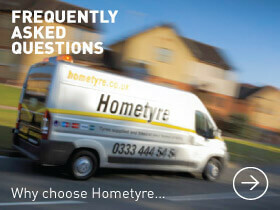 Here at Hometyre one of the most common topics we speak to people about on a daily basis is the dreaded PUNCTURE! Something nobody wants but we don't doubt many of you have experienced at least once. Some of the typical reasons could be a nail in the tyre, or a thorn stuck in the tread, sometimes even a piece of broken glass. This is definitely not something we see every day! If you get a puncture and need your tyre repairing or replacing, here at Hometyre we can often do same day fitting. Call us today on 0333 444 5454. 4 Brand New Nokian Winter Tyres fitted to an Audi Q7 in Cambridge! It's officially December and you can definitely feel it in the air! The nights are colder and longer and those frosty mornings on the road aren't going anywhere just yet! We're speaking with customers every day who are either swapping their existing summer tyres over for their winter tyres from last year, following a quick check-over by us to check they're still in good condition, or enquiring for pricing on a brand new set of winters. At Hometyre Cambridge we went out to a brand new customer, who had been recommended us by a friend, to fit a full set of Nokian WR SUV Winter Tyres to their Audi Q7. They had been reading up on the benefits of winter tyres and after a call to our sales team they opted to go for a well respected brand, Nokian. All it takes is a quick web search and you'll see countless videos and blog posts about the benefits of switching to winter tyres, they offer a much better grip on the road, a shorter braking distance and considerably reduce the likeliness of an accident due to winter conditions. Many drivers seem unwilling to switch to winter tyres with the belief they are only effective on snow or ice covered roads, and admittedly, winters in the United Kingdom do not have as much snow as some other European countries. However, winter tyres are not only useful on snowy and icy road surfaces any more. 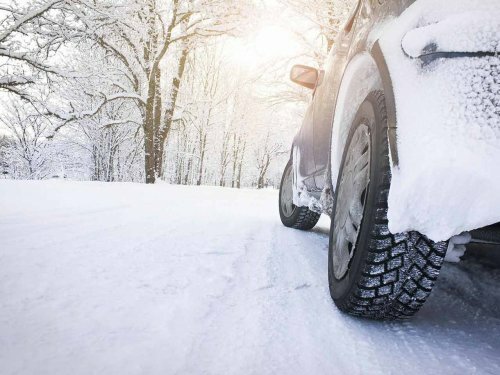 Advances in tread pattern design and modern rubber compound technology ensure that winter tyres also provide higher levels of road safety on damp and cold surfaces. Winter tyres are thus recommended from early November until late March to increase your vehicle's grip during winter. Winter tyres should always be in excellent condition, as worn tyres are ineffective on snowy, damp, or icy surfaces. Call us today on 0333 444 5454 to discuss your Winter Tyre options! Hometyre can supply and fit an aftermarket TPMS system to your car, van, caravan or trailer to give you peace of mind. The system includes professionally fitted sensors inside each wheel and a remote display fitted to the car. Each sensor will display the tyre pressure and warn of any loss of pressure to help keep you safe. Call us today on 0333 444 5454 for more information and cost or get more information online here. The dynamic behavior of a pneumatic tyre is closely connected to its inflation pressure. Key factors like braking distance and lateral stability require the inflation pressures to be adjusted and kept as specified by the vehicle manufacturer. Extreme under-inflation can even lead to thermal and mechanical overload caused by overheating and subsequent, sudden destruction of the tyre itself. Additionally, fuel efficiency and tyre wear are severely affected by under-inflation. Tyres do not only leak air if punctured, they also leak air naturally, and over a year, even a typical new, properly mounted tire can lose from 20 to 60 kpa (3 to 9 psi), roughly 10% or even more of its initial pressure. Fuel savings: According to the DoT, for every 10% of under-inflation on each tyre on a vehicle, a 1% reduction in fuel economy will occur. In the United States alone, the Department of Transportation estimates that under inflated tyres waste 2 billion US gallons (7,600,000 m3) of fuel each year. Extended tyre life: Under inflated tyres are the number 1 cause of tyre failure and contribute to tyre disintegration, heat build up, ply separation and sidewall/casing breakdowns. It is important to note that not all sudden tyre failures are caused by under-inflation. Structural damages caused, for example, by hitting sharp curbs or potholes, can also lead to sudden tyre failures, even a certain time after the damaging incident. These cannot be proactively detected by any TPMS. Installing the TPMS for vehicles will cut the costly hours of downtime caused by under-inflated tyres. It will also reduce the maintenance hassle as you don’t need to undergo the hassle of checking the tire pressure with a manual gauge. Improved safety: Under-inflated tires lead to tread separation and tyre failure, resulting in 40,000 accidents, 33,000 injuries and over 650 deaths per year. Further, tyres properly inflated add greater stability, handling and braking efficiencies and provide greater safety for the driver, the vehicle, the loads and others on the road. Environmental efficiency: Under-inflated tyres, as estimated by the Department of Transportation, release over 26 billion kilograms (57.5 billion pounds) of unnecessary carbon-monoxide pollutants into the atmosphere each year in the United States alone. The French Sécurité Routière, a road safety organization, estimates that 9% of all road accidents involving fatalities are attributable to tire under-inflation, and the German DEKRA, a product safety organization, estimated that 41% of accidents with physical injuries are linked to tyre problems. The European Union reports that an average under-inflation of 40 kPa produces an increase of fuel consumption of 2% and a decrease of tyre life of 25%. The European Union concludes that tyre under-inflation today is responsible for over 20 million litres of unnecessarily-burned fuel, dumping over 2 million tonnes of CO2 into the atmosphere, and for 200 million tyres being prematurely wasted worldwide. Keeping the Office safe this winter!! We strive to keep you all safe on the roads this winter by promoting the importance of checking your tyres and looking at fitting winter tyres to your vehicle. We also need to keep our staff safe in the office this winter - so to ensure we're all safe and sound we got Lauren first aid trained! Taking Care of Your Winter Tyres! The weather seems to have taken a sudden turn for the colder here in the UK! We've been receiving a lot of calls from both new and old customers about having their summer tyres swapped for their winters or getting a brand new set of winters put on to prepare for the cold months ahead! However here at Hometyre we want to make sure you're also thinking a little further ahead! We've put together a check list to make sure you're looking after your winter tyres this season! Check your tyre pressures every few weeks - inflation pressure will have a big impact on your driving comfort and tyre wear, keep those pressures at the recommended psi! Measure your tread depth more than once during the season - if you can check it once a month that is ideal. For a guide on how to check your pressures using the good old fashioned 20p method, click here! Check your tyres for even wear - if you notice your tyres are wearing more on one edge it will definitely be worth getting the wheel alignment looked at - if you need more information on this just call us on 0333 444 5454! Check the age of your tyres - tyres last for around 6 years in active use, if you have had your winter tyres for longer than this they may not be performing effectively. The rubber compound with harden and crack over time which leads to reduced grip. If you need any advice on winter tyres just call our sales team on 0333 444 5454 and we'll be more than happy to give you all the advice you need to keep you safe on the roads this winter! Don't get stuck with your summer tyres this winter! The weather is already starting to turn and it feels like winter has suddenly hit us all hard! We've been in contact with one of our Shropshire customers who had a full set of Nokian winter tyres fitted to her Audi A4 in November 2017. We spoke with her about the difference having winter tyres made during the heavy snowfall we had earlier this year, see her story below. Last winter I was working in North Yorkshire and awoke one morning to find a few inches of snow had fallen, I was staying at a holiday let on a farm and had a very steep driveway to climb to get onto the main road and a narrow gap between buildings at the top, luckily with my winter tyres I had no issues getting going that morning. I had to go over the North Yorkshire Moors that morning to get to my client and en route had a steep hill to drive up. It was now a bright morning and I could see a car at the top of the hill stuck and the driver trying to dig his way out with a shovel. Every time he got back into his car it just slewed all over the place. I decided to wait at the bottom of the hill to give him space and avoid him possibly sliding back into me. A few cars also had to stop behind me because the road had effectively become a single track road because of the snow, so passing me was not really an option..
A big L200 4x4 then came around the corner at the top just as the guy who had been having problems, successfully managed to get going again and I had started to climb the hill. It was obvious the driver of the 4x4 was not going to stop at the top of the hill and wait for me and those behind me, to come up the hill. He just came down the road anyway, down the tracks made in the middle of the road as either side was still virgin snow. He gave me no choice but to pull over into the virgin snow on the side of the road and 'smile' at his smug face as he passed me. Thanks to my fabulous winter tyres I had no problem at all getting out again and up the hill and on my way. I will always change to winter tyres as the difference in traction is unbelievable. I do 30K miles on the road each year and the weather has never stopped me! If you have a busy schedule and don't want the bitter British winter to hold you back, give us a call today so we can check winter tyres available for your vehicle! Get Into The Groove! Tyre Safety Month 2018! It's almost the end of Tyre Safety Month but that doesn't mean we're not going to stop doing all we can to promote the importance of CHECKING YOUR TYRES! Watch this video from Tony up in Edinburgh if you need a little help with how to check yours! Halloween is almost here – don’t give yourself a scare with part worn tyres! As well as being the month of Halloween, October is National Tyre Safety Month so we've been promoting the importance of checking your tyres even more than usual! There are plenty more factors to keeping you safe on the roads than just tyre pressures and tread depth… one of which is AVOIDING PART WORN TYRES! When looking for tyres some people may consider part worn tyres, thinking they are a cheaper or easier option. This is not the case! If you look into how much tread is left on the tyre, the age of the tyre or any potential cracks in the side wall of the tyre, the life left in that tyre could be minimal, if any at all! You are not saving money in the long run and you could be in serious danger on the roads. There are so many horror stories out there about the consequences people have suffered from driving on part worns, you are not only putting yourself at risk, you are also putting your friends and family at risk if they are passengers in your car. Other motorists on the road could also be at risk if you lose control of your vehicle due to insufficient tread depth, you may think you are saving money but you could end up paying a terrible price. It's impossible to know the history of part worn tyres and the true extent of any damage which may have occurred inside the tyre, only by choosing brand new tyres can you be sure they are free of any hidden dangers and you are safe out there on the roads! In the spirit of the Great British Bake Off – do you have the perfect hump?! The Nation is getting into the baking spirit thanks to the Great British Bake Off, as millions of viewers tuned in last night to watch the semi finals as the contestants took on Patisserie Week! One of the talking points of the show this week was "Hump Puns"! We're sure there's not much that links the baking world with the world of tyres but this is one link we can make! Just like the judges were after the perfect "hump" on the cakes, we're after the perfect "hump" on your tyres. It's important to check you have the correct pressures in your tyres as having them under-inflated can lead to heavy wear on the outer edges, if they are over-inflated you will see heavier wear on the middle of the tread. The correct pressures for your tyres can be found in the vehicle handbook or printed either in the sill of the driver side door or the inside of the fuel tank flap. See the picture below for how incorrect tyre pressures can seriously affect your tyres! If your tyres are showing uneven wear you may need to adjust your pressures, if you need any advice just call our team on 0333 444 5454! Stay Safe this Winter with Nokian Tyres! 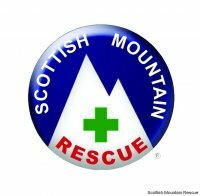 Scottish Mountain Rescue have announced that from October 2018 they will be sponsored by Nokian Tyres. All of their vehicles will be fitted with Nokian Tyres' most recent and innovative products. The tyres used for Scottish Mountain Rescue Vehicles will have a unique innovation incorporated into the tyres, Aramid Sidewalls. This means they will have Aramid Staple Fibres built into the sidewall compound, this material is used in military and aerospace technology due to its strength and lightweight characteristics. This will result in a reduction in damages to the tyre from potholes or any other sudden impacts. If these tyres are helping to keep a mountain rescue team safe on the roads this winter imagine what they could do for you! Take a look online to see what we have available in your size - if you can't find what you're looking for online then just call our team on 0333 444 5454 so we can help to keep you safe on the roads this winter! West London is Live! Brand New Tyres in West London! We have a brand spanking new van hitting the roads of West London as of TODAY! We’re now offering more coverage of the London area so if you need your tyres fitting at home or work call our friendly team on 0333 444 5454! We can do car tyres, van tyres, caravan tyres, winter tyres, puncture repairs, wheel alignment and so much more! TYRE SAFETY MONTH 2018 - Check Your Tyre Pressure! With Tyre Safety Month 2018 officially here we have been talking about how important it is to check the tread on your tyres using the 20p test. Something that is equally as important is checking your Tyre Pressure. Having the correct pressure in your tyres ensures the vehicle handles as it should. As well as improving the handling, if you have the correct pressure in your tyres this also improves the fuel consumption. Another issue that can arise from having incorrect pressure in your tyres is uneven wear, if they are under inflated your tyres will wear heavily on the outer edges. However if the tyres are over inflated then you will see wear on the centre of the tread. The car manufacturer will typically display the correct pressures in the door shut or filler cap but they can always be found in the owner's manual. Keep in mind that there will be two pressures shown, one for normal loads and the other for when fully laden. If you need to chat to a member of our team about your tyre pressure or any other queries you may have just call us on 0333 444 5454! Winter is creeping in... Check your tyres! 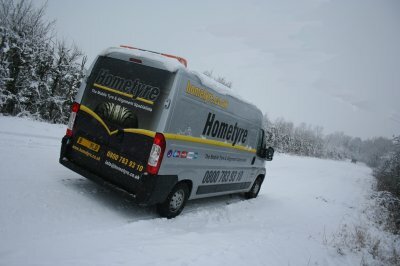 Here at Hometyre we've already had a selection of phone calls enquiring about purchasing new winter tyres or having their summer tyres swapped to winter tyres. 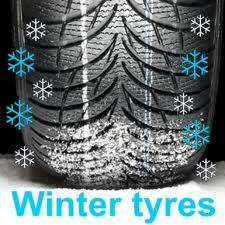 Over the past week stock in winter tyres has been increasing and more and more options are becoming available. If you're someone who rarely thinks about your tyres, by ignoring them you're putting the safety of you and your family at risk. With the cold weather starting to set in and also it being the start of Tyre Safety Month we thought now would be the perfect time to give you a little more information on winter tyres! The reason we recommend winter tyres is because you cannot expect your tyres to perform efficiently between a temperature range of +30°C and -15°C. When temperatures drop below 7°C this is the ideal time to look at putting on your winter tyres, this is typically between October/November and March/April. When temperatures drop below 7°C the molecules in the tyre tread harden and eventually freeze, tyres then become less adaptable to the road surface, this reduces grip. Changing to winter tyres can reduce your braking distances, give better grip, better driving control and all round a higher sense of safety in winter conditions. If you're still unsure on the benefits of changing to winter tyres just call our team on 0333 444 5454 and we can give you all the advice you need! And the LARGEST Tyre Manufacturer in the World goes to… LEGO!? This may come as a shock to many of you but the World famous company LEGO were recently named the largest tyre manufacturer in the World! 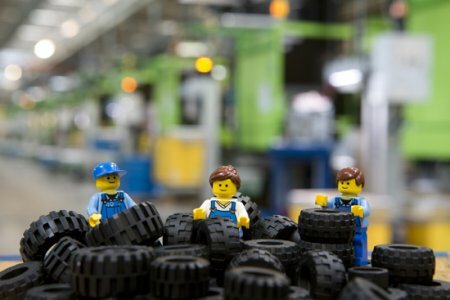 The large volume of tyres produced by the company is down to almost half of all Lego sets including wheels of some sort. In 2006 the Lego Group produced 15 billion individual pieces of Lego, including 306 million tyres, by 2011 this had increased to 318 million tyres produced! This is over 50 percent more than any other tyre company including the well known Michelin, Bridgestone and Goodyear. Although we won't be stocking that size any time soon we still think it's a pretty great achievement for Lego! How often do you check your tyres? Checking them just once a month, that's only 12 times a year, could make a huge difference and even save your life! 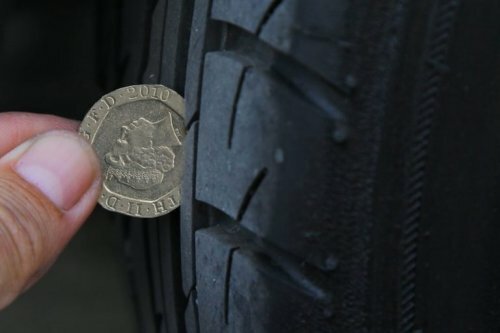 October 2018 is Tyre Safety Month, so here at Hometyre we're kicking things off by encouraging you all to grab a 20p coin out of your pocket and pop outside to your vehicle. Put your handbrake on and make sure your car is not in gear, start your engine (if you have powered steering) and lock your steering fully to one side then switch off your engine. This will enable you to see across the full tread area of the front tyres. Now place your 20p coin into the main tread grooves of the tyre, if the outer band of the 20p coin is not visible when inserted, your tread is above the legal limit. The legal minimum tread depth for cars in the UK is 1.6mm throughout a continuous band within the central ¾ of the tread. If you can see the outer band of the coin your tyres may be illegal and unsafe. You should have them checked immediately by one of our qualified tyre professionals. If you do not have enough tread in your tyres it can seriously affect the way the tyre disperses water in wet conditions, something we don't doubt there will be a lot of coming our way the in UK this winter! The grooves in the tread help to remove water from the area between your tyres and the road, if these grooves are not deep enough it will affect how your car breaks, steers and accelerates. If you are unsure on how to check your tyres or need more information, simply click here or call our sales team on 0333 444 5454. The world of tyres and shoes has collided! Two entirely different worlds have come together thanks to the company Hugs & Co, the company established in 2012 in London and have combined a history in architecture and business to create this popular footwear brand. On 30th August this year they announced they have been working on The British Driving Loafer, a shoe with a sole made using up cycled waste tyres! The tyres are combined with Italian leather and a stylish British design to bring us the first ever line of environmentally conscious footwear. The idea behind this design is to use a fraction of the energy used to produce new soles to convert the waste tyres into usable shoe components. Ensuring the process is environmentally friendly has not compromised on the high quality Hugs & Co strive for in their shoes, the new soles have increased durability and excellent grip, much like the qualities you look for in a tyre! The material used for these shoes would otherwise be burned or buried which would cause significant environmental damage so this new production line is a win-win! 5. Tyfoon - Hmmm perhaps more commonly linked with devastation and carnage than safety and grip! We can see what they were trying to achieve in terms of awe and power - but perhaps a little lost in the translation! Certainly not the worst, that's for sure. 4. High Performer - Economy tyres are definitely higher performing than any part worn tyres but we still think this is a little too ambitious for a cheap tyre. Still, we suppose they'd hardly sell many if they called it an 'Average Performer'! 2. Catchpower City Racing - Brilliant! What on earth were they thinking with this one? This just seems like four random words thrown together that don't make much sense! For one, you definitely can't exactly catch power and secondly, have you ever tried racing in the city? We wouldn't recommend it! AS far as the product goes - it's actually pretty good. Not the easiest to talk about over the 'phone though. ALLOSAURUS - this is just great! 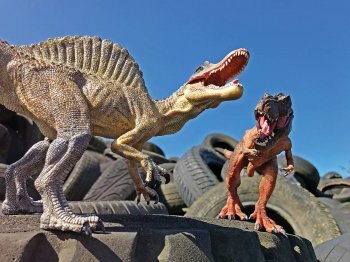 What better combination than tyres and dinosaurs? The link is so obvious!!?? This definitely wins hands-down in our eyes! We may struggle to sell you these by name! So........ if you don't want to become extinct just like the dinosaurs (best we could muster up! ), check your tyres TODAY! It takes no time at all, for a guide on how to check them just click here! In the latest published five-year averages, tyres have been recorded as the cause in 35% of all casualties. This figure rises to 39% when someone has been seriously injured or killed and equates to 183 people per annum. It may surprise you to learn that it is significantly more than the 129 people seriously injured or killed in an incident where a mobile phone has been the contributing factor. Furthermore, 2.2 million MOT failures have been down to tyre defects. Department for Transport data shows that most incidents frequently occur during the summer months and not the winter months during wetter and colder weather. The top three most hazardous months actually being, July, August and June according to the Department of Transport. TyreSafe have identified several factors to explain why this is the case. Not a surprise to UK residents, but the British summer does not always have consistently good weather (except for summer 2018 which came as a surprise to everyone!). What most drivers are not prepared for are the often wildly varying road conditions during the summer months. Drivers can tend to become a little complacent during fairer weather conditions and become somewhat desensitised to the potential hazards and dangers. This, in turn, reduces the number of safety tyre checks carried out by motorists on their vehicles. Secondly, more families are now remaining in the UK for annual summer holidays - meaning they are travelling longer distances, putting more weight into their vehicles. Naturally this alters the loads on tyres increasing the physical stresses placed on them and makes already poorly maintained tyres more likely to suffer problems. During the summer period and with motorists travelling around the UK often using different roads to which they are accustomed to and using their tyres differently to the rest of the year, there is a consequential rise in tyre-related incidents. 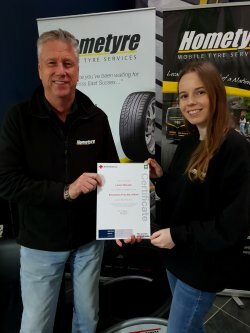 Global tyre manufacturer, Continental, has been quick to pick up on this fact and have added their own message, "As part of our Vision Zero initiative which aims for zero accidents, injuries or fatalities on our roads - we are keen to make motorists aware of the small steps they can take to make their journey safer this summer". Another important consideration to pay attention to is vehicle stopping distances in the wet. Although this year temperature records have been broken, it rains on average 156.2 days of the year! Drivers are often caught off guard when braking on wet roads in the summer. Braking distances at 60mph increases by as much as 15 metres! That's a staggering distance when you think about what could be stopped in front of you... Poor tyres further compound this issue and should prompt closer tyre inspections. Part Safe Tyres. Have You Been Paying for Scrap Tyres? Part worn tyres are yet another issue. Drivers are still buying them as a supposedly cheaper option. This is seldom ever the case though. More often than not they are sold by unregulated and unscrupulous sellers with no concern for motorists safety and will sell products that have been purposely disposed of with good reason. Technically scrap tyres are resold from waste for cash and without recourse. Information from TyreSafe and joint statistics from Trading Standards show that between 34 and 58 per cent of Part Worn Tyress are deemed unsafe - while 94-98 per cent are non-compliant with current regulations. Simply put, these items are not a good option in any circumstances - especially the safety-factor. As we approach the last summer bank holiday weekend just a reminder that we are open for trade on Saturday 25th August but closed on the Sunday and Monday. The sales team will be open until 12.00 midday on Saturday, however as the week has progressed we have seen the fitting slots quickly filled, so as the old saying goes - "book early to avoid disappointment " applies. We'll be ready to take your calls on Tuesday from 08.00 but please do feel free to book online! So if you're planning on going away and need tyres, please contact us sooner rather than later to ensure we can fit you in. As some safety advice, if you're going away check your tyre pressures and increase them if you are carrying extra loads. Once you have returned from your journey - decrease back to the usual running pressures, and Do NOT FORGET to check your spare! So as the the long hot British summer moves into August and the peek holiday season, its worth reflecting on the the trade we have recently seen. Whilst caravaners and motor homers are major client's at this time of year as they prepare their vehicles for long journeys , motorists in general are not aware that their tyres may need replacing, through their normal driving , (rather than inspection ) as the warm weather makes tyres more "grippy" than normal. Thus when the weather changes ( and it inevitably will!!) car and van drivers will see their vehicles handling much differently. So from a safety point of view , check your tyres for wear and don't forget to check the whole tyre not just the parts you can see. We are still seeing customers who are victims of the rash of pot holes that occurred in the spring. Do not let yourself become one of these, Take care, slow down and remain vigilant. Tyres form part of your cars suspension and whilst they designed to be flexible , pot holes mean that the tyre is working beyond its design envelope and will almost certainly fail causing the motorist disruption. We are still seeing clients who had two set of tyres one winter, one summer swapping them over , although this is usually a spring an autumn activity. If you have never thought about having two sets of tyres why not consider it now? Stocks of winter tyres will soon be plentiful in the UK for the 2018 winter season. In many European countries it is mandatory for car owners to swap between winter and summer set. With the changing Uk climate it may be worth your investment in some. Cars from 2012 had to have T.P.M.S. ( Tyre Pressure Monitoring Systems ) installed. We are now seeing the valves or their components failing. All the Hometyre vehicles carry an extensive stock of replacement parts and we can can your existing valves to determine their status. This growing market is becoming a major offering to customers especially those whose vehicles do not come with a spare tyre. Whilst most modern cars had the "can of junk" this will not sort a valve failure.